PHOTO - Chris Maher and Danny Sillivant (inset) divvy up duties at Burden Creek Dairy. That’s when he discovered Burden Creek Dairy, a family-run goat farm on John’s Island that produced cheese for a number of Charleston restaurants. Hungry for something new and eager to learn the trade, Maher gave then-owner Kip Valentine a call, hoping to nail down an apprenticeship. Valentine gave an enthusiastic yes, naturally, “because no farmer is going to turn down free labor,” Maher laughs. A few months later, Valentine approached his mentee with an idea: How would he feel about buying the farm? Despite Maher’s amateur status in the field, he made the leap, and in the spring of 2017, took over Burden Creek with his partner, Danny Sillivant. The transition was a big one: Maher found himself out of the kitchen and elbow-deep in curds and whey; Sillivant had jumped from a gig in real estate to milking and caring for a herd of 30 to 40 goats, all with distinct personalities. Almost a year in, the job isn’t easy. “With just the two of us, it’s a lot of work,” Maher notes. 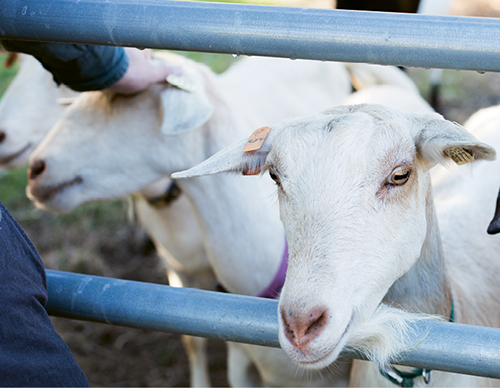 Sillivant adds, “It’s been a labor of love.” Most days, they divide and conquer: Sillivant is the resident goat-whisperer, checking off two three-hour milking sessions a day. “I’ll talk to the goats, and sometimes sing to them,” he laughs. 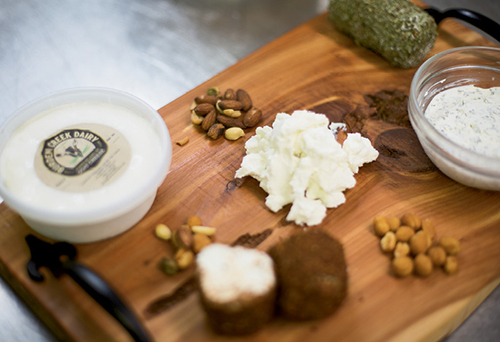 Maher focuses on churning out the chèvre: “It’s so rewarding to make a product and deliver it to the chef yourself,” he says. The biz has some noteworthy clients, too: Husk, Charleston Grill, and Sorghum & Salt, among others, serve their cheese, thanks partially to the help of distributor and small farm advocate GrowFood Carolina. Burden Creek goods can also be found at other area retailers including Veggie Bin and the John’s Island Farmers Market. PHOTO - Their herd, made up of some 30 females and one male (his name is Francis), has room to roam on their John’s Island farm, which is outfitted with slides and log piles for the goats to play on. While they’re only vending soft cheeses and raw milk for now, Maher wants to experiment with hard aged cheese in the future. “My goal is to come up with the next Humbolt Fog,” he says, referencing the acclaimed California goat cheese. In the meantime, things have come full-circle on the farm. “We just got a few interns who want to do the same thing I did,” Maher says. “I didn't expect that so soon.” Now, the farmer has stepped into the role of teacher, passing on tricks of the trade.